« Species 0.5.0 is out! I know the original plan was to work on the simulation first, but 0.6.0 will be a slight deviation: I’d really like to fill out the gameplay profile above with Species-level Interaction and Ecosystem-level Observation tools. Aside from being entertaining, these upgrades should provide systems that will help me tweak the simulation in the future, and will allow me to focus exclusively on the sim for later updates rather than switching between interaction and simulation work all the time because I’m still worrying about whether the game is “fun enough”. A 2d satellite map of the entire world, showing creatures as coloured dots or icons. Currently the player has to zoom out to see the movement of the creatures as a whole, which makes population concentrations hard to spot and the geographic distribution of different species impossible to track. This abstract view will allow for a much better visualisation of population dynamics in general. A proper one, with zoom and pan, and a “fossil” copy of the Species Average stored every few generations, stored as a node on the species line. Since it’s going to be sprite-based rather than render-target based, features like per-pixel population-sizes will be lost. I’m okay with this, since in exchange we get loads of other features: selecting species by clicking their lines, and shuffling the nodes of the graph as it develops (so you don’t end up with lines on top of lines), and viewing the graph in real-time or symbolically by generation, will be possible. The population history will remain in the game, since it’s per-pixel population sizes are still useful, but I’m not planning on working on it any further. This new graph will replace it as the games official Tree Of Life. I’m also not sure whether I’ll get to it, but I’d like to make is possible to see a “march of evolution” of the selected species avaliable as a part of this feature. That might get postponed, though. I think this will probably be one of the most important features of 0.6.0, since it will give the in-game evolution post hoc evidence of actually having happened. It gives each saved world a past history, rather than just a present moment. I cannot wait to work on this one: it will be a great way to see exactly how the mechanism of speciation works. What it will do is show genetic relationships as a node-link web, complete with it’s own elastic physics, world-of-goo style. Baby creatures will be added to the web, and dead creatures removed, in real time. Different species will be visible as groups of nodes with no links connecting them. Speciation itself will be visible as an area of the web ‘breaking off’ as the links (creatures) holding it to the main population die out. 1. The Mk1 All-Terrain Programmable Rover. Yes, we are going to add a rover. Or more accurately, rovers: I plan to make them spawnable, so you can set up as many as you like. This early in the piece they’ll be programmable only in the most simplistic fashion: [Feed/Kill] creatures who are [High/Low] in [Statistic]. But the advantage of it is that it will be operational at 10x speed, and it won’t get bored like a player would: it’ll just keep doing it’s thing until you tell it to stop. This will make artificial selection much easier to apply. They’ll definately be drivable, if only because it’s easier to program them that way in order to test the physics, and it seems silly to remove a feature like that. I don’t know yet whether you’ll be able to do anything with them when you’re drive them. I want to give these guys decent physics, too. None of the oversimplistic stuff the creatures use: the rovers will exist in limited numbers, so they get to have proper suspension and tire-friction. I’m hoping to do a halo|warthog-style exaggerated physics model for them, to give them a bit of character and make them fun to drive. I realise that doesn’t make much sense for a scientific rover, but there’s no way I’m going to pass up the chance to make something rediculous awesome. I really don’t like “island” being the only world type: the semi-static shore biomes annoy me and the biome system is capable of much more than just islands. Simply adding a minus sign the the height/fertility equation can give us islands of forest in a salt plain, for example. So making the world system more versatile will be an important step. Simply because it’s something I’ll have to do sooner or later. Might as well get it out of the way. Oh, and it’ll probably come with a bunch of other tweaks and fixes to implement as I go, much the same as I did for 0.5.0. One big advantage of the stuff included in this update: all of these features will be a lot faster than anything in the last one, which involved several major overhauls to existing systems. These are just UI screens and spritebatch representations of existing data. This entry was posted on March 6, 2013, 8:13 pm and is filed under Uncategorized. You can follow any responses to this entry through RSS 2.0. You can leave a response, or trackback from your own site. You think we could collaborate somehow? I love the game by the way! Hey, sorry it took me so long to reply. I’ve been rather neglecting this blog of late. I love your approach to teaching evolution: it’s intuitive, understandable and takes into account the branching nature of evolution and biodiversity, which is something I’ve almost never seen. I imagine those kids are going to have a much better understanding of evolution in the future than their peers: a lesson like that sinks in. I’m not entirely sure how you’d make it interactive: depends on whether you want to make the tree interactive, or you want to make a web-based version of the game that created the tree. For the former, there’s not too much you can add to the zoom and pan functionality of a basic image. For the latter, you’d have to make something incredibly complex, probably web-based. For obvious reasons I don’t have the time to help you too much with the code side of things, but I’d be more than happy to discuss idea’s with you. Ha, yeah well, ultimately I’d like to make some kind of program so people could do the ‘game’ without my input so it could live on its own, but what I was talking about was more of a way for me to input creatures into some kind of automatic tree that I could update with images (in other words something similar to what you’re making for Species game). Hey! I LOVE your game, and it’s good to see that the developer is still thinking of things to improve the game by! This is the best AI Life simulator I could find so far. When you do release new updates though, will the game update automatically, or should I check back here and download the newest update from the site? Thanks! The game won’t update automatically: you’ll need to check back and re-download when it’s updated. You can keep tabs on how the update’s going over at the development thread on the forums. Herbivorous creatures can already change their environment, by eating tree’s and/or overgrazing an area. But I like environmental feedbacks, so I promise to put them in wherever I can. Controlling a creature isn’t really an option in Species, partly because it’s not designed that way, partly because at a close-up level the lives of the individual creatures aren’t that interesting, but mainly because it would be a terribly depressing gameplay mechanic. Even the luckiest creatures don’t live very long, and ‘success’ (reproduction) is usually followed by a long, gradual decline as the creature fights a losing battle against an aging metabolism. Oh, I see. That’s a much easier proposition: in fact, I may be able to help you out with it. 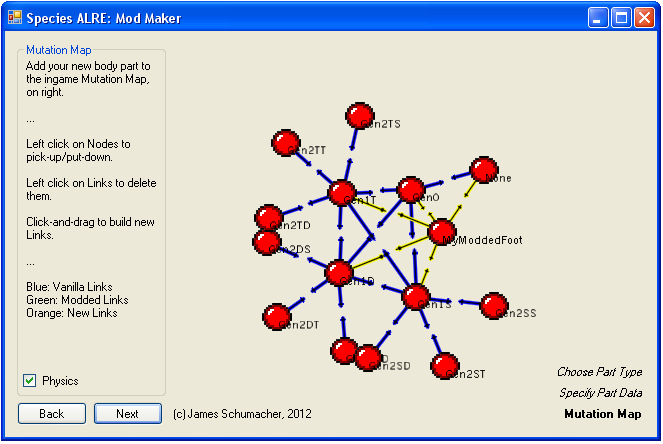 My “Mod Maker” application includes a basic web-physics sim, originally for the mutation mapping. Something like this would be good for tree-of-life modelling: you just import a node, link it to another node, and the physics keeps nodes away from each other so the map doesn’t get all tangled. The end result is something fairly similar to your tree of life image, but with straight lines rather than curved ones. My suggestion was basically a particle simulation in Actionscript: you essentially create a lot of different “Nodes” or particles, and loop through them applying 2d forces based on their distances to each other (and then move them based on these forces). Their reactions to one another cause them to automatically form up into the right “tree” shape. That sort of thing is lower down the chain than the examples you just linked, which is advantageous in one sense (you get exactly what you want: I don’t think there’s any pre-built infographic software with the physics I mentioned above) but is also a lot more work and requires you to learn more. On the other hand, the infographic software you just linked would definately allow you to manually position nodes and have the links follow them around. Heck, even MS Word 2010 has some neat infographic software. It’s really up to you: do you want to make something fancy for people to play with, or are you just after an easier way to build a tree graphic? I suppose a little of both, but ultimately I would like for people to play with it on their own. Is there a limit for how big the flash file could be and still function? Because there are a ton of these little drawings. After playing with this for a few days, i’v came up with a list of things that would be awesome to see. you don’t have to take them if you don’t like, there more like suggestions. Also other people may have suggested these before or you have a note/plans on what was already said and may bring them up in future updates, how ever i’ll post these if you haven’t thought of some already. -Natural Mutation/Superior genes. Example: it was hard to run/jog/walk with stumps so i’m going to try something else but these arms were good enough to help me eat, and pass down that information to the offspring. -=Watching how things develop over time and wanting to know what they will become, excites me. -Collectives/Roamers. Example: creatures would tend to group together and aid each other/creatures that would roam solo or in a pack. -Greater Number of everything. Example: Larger creature cap/Land mass, etc. I’v found that i could no make the caps of things larger then i wanted to, the game kept crashing, i know my computer can handle larger numbers of creatures. -Creature impact. Example: Buildings/Holes, etc. of course creatures could only do some of that once smart enough. this goes with Artificial intelligence. -=Seeing other creatures build things there way, also fascinates me. -Environmental Disasters. Example: Storms, earthquakes, volcanic eruption, tsunami, etc. I have seen the environment change from desert to snowy how ever it would be nice to see visual effects to illustrate that. -=Knowing that even the landscape is living in its own way, is just awesome. -Elements/Material. Example: Having materials the creatures could interact with, metals/spices, etc. this goes with Creature impact. 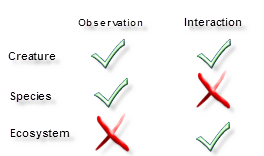 -=Looking at how each creature interacts with different materials, has observational value to it. -Game crashes during creating world screen when increasing values above what they should be. -Game Crashes during game play, i don’t remember the exact moment, how ever i had creature cap at 2000, and map size 2. NOTE: This is mostly what i would like to see in the game/simulation. Honestly this game is tons of fun already and would like you to continue working on it. If you wanted more info on some of the points cause i didn’t explain it well or just want to know more about it, you can email me at BigKilLol.Sawyer@hotmail.ca. I had more ideas for the points above, and the references i can’t think of anymore at the moment. Also if i come across more things that may need fixing i’ll try to notify you. Heh, you’ll be glad to know quite a few of your suggestions are planned features in one form or another. Some new historical graphs have even made it into the development version of 0.6.0 already. You got back pretty fast, haha. I decided to just post everything i had here, instead of splitting up into bits. I can’t go to the offical website! Did you deleted it and created a new one? Please give me the latest website! I REALLY WANNA PLAY CREATURES! It way too AWSOME!! !